The Pikes Peak region offers more than 30 free things to do — meaning days of adventure and Colorado fun for absolutely nothing. Experiences range from hiking beautiful backdrops like Helen Hunt Falls to ascending Pikes Peak – America’s Mountain via Barr Trail to exploring the famed U.S. Air Force Academy and challenging Team USA hopefuls as they climb the invigorating Manitou Incline. Enjoy museums, art walks and outdoor recreation without spending a dime. Peruse the impressive galleries of the Colorado Springs Fine Arts Center at Colorado College each month during free admission and family adventure days. 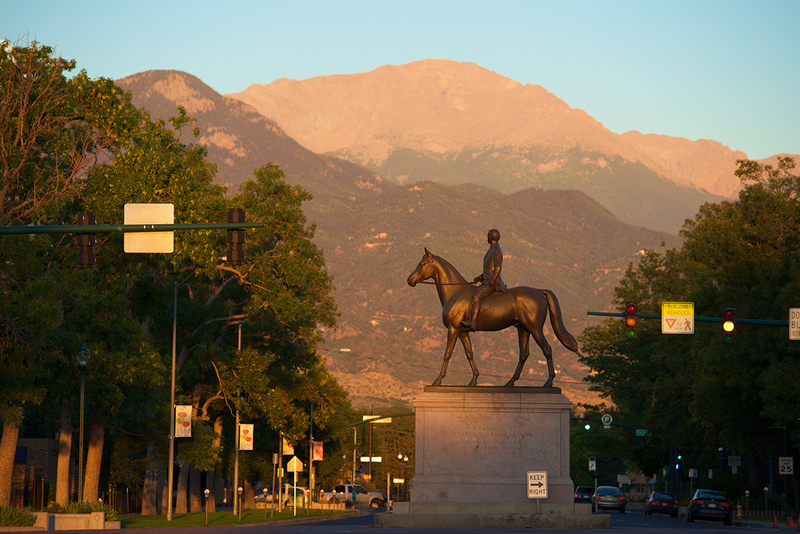 Or take a self-guided tour to see the various outdoors sculptures of the downtown Colorado Springs’ Art on the Streets program. Indulge the need for speed at the Spencer Penrose Heritage Museum, full of presidential carriages and past Pikes Peak International Hill Climb racecars. Learn the storied history of the region and the people who founded it at the Colorado Springs Pioneers Museum, situated inside what was once the El Paso County Courthouse. Additionally, free tours can be scheduled at Focus on the Family and Compassion International. Nearby Manitou Springs offers the refreshing sips from eight public mineral springs flowing throughout out town. Bring your own cup or make a stop in the Manitou Springs Visitor Center for a free cup and walking tour map. Then, head to the Manitou Springs Heritage Center for some interesting background on this charming mountain town. Further west, the town of Cripple Creek offers a glimpse into the days of the Pikes Peak or Bust Gold Rush. Enjoy spectacular views of the city below before visiting the Cripple Creek Heritage Center. Keep your eyes peeled for the donkey herd that roams the city in the summer and fall months (they love apples and carrots, if you have them handy) and visit in June for the annual Donkey Derby Days to watch the famous donkey races. Head to the Royal Gorge region for an unforgettable trip along Skyline Drive. Pull over to get a closer look at the petrified dinosaur tracks. Indulge in a picnic lunch at overlooks showcasing views of the impressive Royal Gorge. Make it a sweet ending with a free tasting at the Winery at Holy Cross Abbey.